History has certainly influenced Umbria also from a gastronomic point of view, therefore we propose a series of tastings of wine, oil and other typical products to better savor our land. The first part of this trip is a visit to a famous Montefalco vineyard with a wine tour and tasting. We will then move to a rare breeds pig and sheep farm where they breed the ‘Cinte Senese’ pig, a pig particular to central Italy. There will be a guided tour showcasing the Farm’s animal husbandry and management. You will then move on to a teaching farm where you will take a light lunch of local cured meats, cheeses and typical local produce. After lunch a farmer will take you on a tour around the farm and give a fascinating and wide ranging explanation of the interactions between the domestic animals (sheep, pigs, chickens etc) local wild plants and herbs, and the mountains. Per iniziare visiteremo uno dei più importanti frantoi dell'Umbria. I proprietari, pluripremiati per il loro olio, ci mostreranno il funzionamento del macchinario per spremere le olive e quindi ci spiegheranno l'intero procedimento che porta al prodotto finale. L'esperienza terminerà con un assaggio dei vari oli di loro produzione. Da qui ci sposteremo presso un maneggio, immerso nella campagna umbra, dove ci aspettano dei cavalli per una cavalcata di un'ora tra i vigneti della zona. Terminata la passeggiata ci fermeremo per un pranzo con abbinamenti di vini presso una famosa cantina della zona. A seguire una passeggiata nei vigneti e nella cantina con spiegazione di tutti i passaggi che trasformano l'uva in un nettare tutto da bere. Possibilità di acquistare prodotti direttamente dalle aziende. Starting from a famous vineyard, you will take a tour in a carriage to discover the Roman ruins of Collemancio or the works of art at the Castelbuono park; this will then be followed by a tour of the local Sagrantino vineyards where you will stop to enjoy a picnic of local meats, cheese and cakes. Lastly you will visit a vineyard specialising in biodynamic wine (ie using organic methods) where you will take a tour, learn about the secrets of Biodynamic winemaking and finish with a wine tasting. From May to September the Castle of Sorgnano offers an unforgettable dinner with live music and drinks included. The combination of outstanding food, live music and the ambience of a medieval castle will forever live in your dreams. Umbria is famous for good food and for the many products produced locally; undoubtedly one of the most famous of these is the truffle. The truffle grows almost all year round and can either be the black truffle or, the most prized of all, the white truffle. There is nothing quite so memorable as the pairing of pasta or local meats with truffle. Truffles can only be found by highly trained dogs and their masters – truffle hunters with years of experience. Your hunt will consist of a walk taking around 2 hours inside the extensive grounds of Sorgnano. The hunt will conclude with a light lunch based on your freshly harvested truffles! We will start by visiting an old ceramics factory that from the 1500s produced and painted ceramics. We will visit the museum and the workshop to see all the processes of this ancient craft. We will then move to Perugia and visit one of the most ancient textile workshops in Italy. Located in a deconsecrated church of the 1300s that still produces fabrics using machinery from more than 100 years ago. From there we will head towards the city centre to visit a glass factory and museum that specialises in making stained glass windows for churches; however, we will first eat at what is arguably considered to be the best pizzeria in Perugia. The Pizzeria still uses the traditional methods started by the founder in 1850. During the visit we will discover the techniques with which these masterpieces are created. Bread, Wine, Oil, Carriage and lots of fun. The day will start with a visit to a bakery who use their own flour made on site to create a multitude of breads and other products. You will see the flour production process including the milling of the wheat using a stone mill. You will then move to a highly regarded vineyard where there will be a wine tour and tasting. From here you will travel to a renowned local olive oil press to discover the secrets for producing the best extra virgin olive oil. Here you will take a lunch of bruschette, lentils and home made deserts. 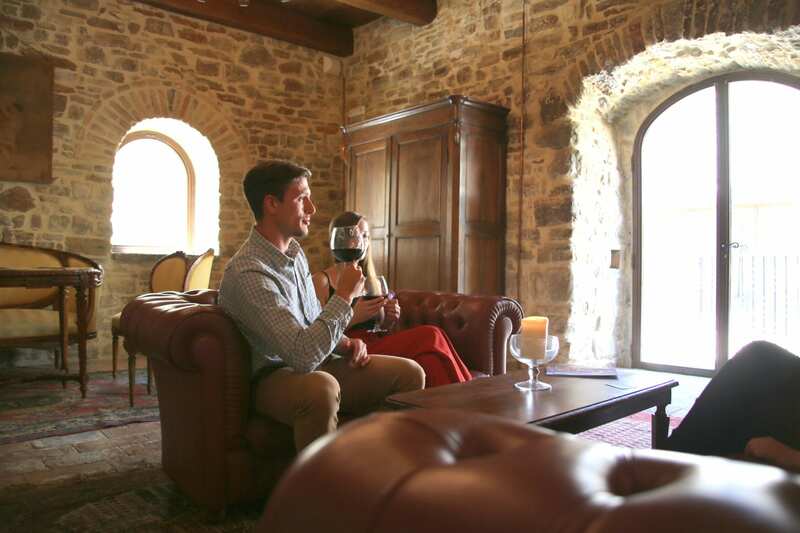 The day will finish with an hour long carriage ride through olive groves and vineyards skirting the ancient town walls of Montefalco where you can enjoy magical panoramic views.